Growing up, I wasn't much into the princess scene. I preferred to sit in the floor with my Batman playsets and watch cartoons. To my mother's chagrin I grew up a gamer, thanks to my father's influence. So, it's fair to say that I'm not too keen on the genre of "games for girls" that companies are so keen on creating for a false demographic. However, I do enjoy my music/rhythm games. I'm also a huge fan of Japanese dating sims. So, when I came across Natsume's latest DS title, Princess Debut, my interest was officially piqued. Princess Debut finds you entering the shoes of an average teenage girl named Sabrina (you can name her something else, but Sabrina was the default), who is on her way home from school when she realizes she'd really like to have a prince in her life. A friend who is making the trek home with Sabrina kindly points out that there are princes in her everyday life in the form of kind and gentle guys that might actually be boyfriend material. Satisfied with this answer, Sabrina heads home. Just as she's ready to climb under the covers, a strange girl who looks exactly like her walks out from her armoire, followed by a talking creature resembling a rabbit. It seems this mysterious girl has escaped from her kingdom to another world so that she can avoid princess life: dance lessons, the royal treatment, and courting princes. It just so happens that Sabrina longs for this kind of life, and volunteers to take Sabrina's place in the other world. Through the armoire Sabrina and the rabbit go, only to discover that Sabrina is now trapped until the royal ball is over. Thus begins Sabrina's new life as a princess, hence the title Princess Debut. This game can best be described as a dating/life sim mixed with a music and rhythm game such as Elite Beat Agents. In the beginning of the game, there are 30 days left until the big ball that Sabrina must perform in, but first she must find a handsome prince as a dance partner. Each day has a title and theme, save for a few days where every event that unfolds is the player's choice. On the first day, Sabrina receives a magical tiara that she finds will transform her into a beautiful princess, complete with a flowing, regal dress. She's given a room to sleep in, lavishly decorated with pink and flowers (little girls will eat this right up), and three options with each day: go out, save, or go to sleep. Going out involves venturing to the practice hall for dance lessons, or to one of the various locations in the kingdom. The practice hall is where Sabrina practices all of her ballroom dancing with a charming rabbit in a tuxedo. Each time a dance is completely successfully, Sabrina earns one experience point toward gaining a level of dance prowess. As you gain experience, new dance types will open up aside from the waltz that is available at the start. Dances include sambas, flamenco, and various other types that correspond to more than just ballroom music. Dancing is simple. The touch screen displays a line to trace in Elite Beat Agents fashion, with a starting and ending point. The top screen displays what shape and direction the next movement will take, and watching the top screen is key to your success. At first, it's just a little difficult because the movements go by very quickly, but a few dances in and it will be old news. In fact, it becomes so simple that it almost ceases to lose its novelty after you've made it to the 20th or so day until the ball. Simple patterns such as semi-circles, circles, triangles, waves, and squares are some of the different designs that you will trace. However, the tracing does not appear in time to the music all of the time, so it can get a little confusing. It's a very lackluster practice and the songs do not make it any better, but for kids, it's a simple and easy to understand premise. For more seasoned music game veterans, Princess Debut's system is just a bit too rudimentary. On certain days, scripted events will occur that will introduce different characters and minigames that you will have to complete in order to make some progress. On most days, however, you will want to utilize the "go out" option. If Sabrina chooses to go out for the day, she can also visit other locations such as the park, the castle, the ballroom, the forest, or other places that are unlocked via playing through each day. Along the way she will interact with different princesses who all seem to be searching for dance partners. Through different dialogue choices, Sabrina will get closer to different princes. As you can imagine, being nicer to certain princes will make them more inclined to speak to you and spend time with you. It's a dating sim, really, and on the top screen there is even a gauge detailing how in love the prince is with you. You can check the same status of each of your acquaintances via the planner, accessible in the top right corner of the touch screen. Because of this, the game has branching paths that will alter the final outcome of the game. Since Sabrina is working toward the final goal of procuring a dance partner and working on becoming a better dancer herself, this game makes sure to remind you of your priorities. However, sometimes your partner might be a bit of a flake and miss dance practice. You have to choose whether to ditch or go with them. There are many similar scenarios that create sort of a double-edged sword, and it makes prioritizing part of the fun. In this, you have some great replayability. With over eight princes, the different outcomes you can get, and different day events are worth playing again for. Aside from small story scenes, dancing, and exploring locations, there isn't much else to the game. There are modes where you can just dance and practice outside of the story mode, but nothing of interest beyond the story mode. 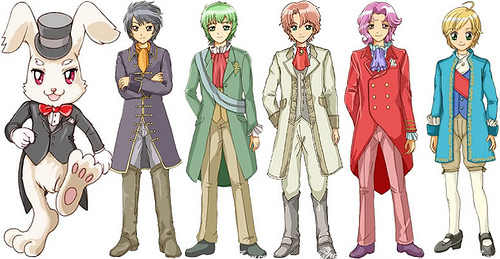 Princess Debut features lovingly drawn, static character portraits and backgrounds for the majority of its graphics. Cutesy anime-styled characters up the saccharine factor and it's clear how much Natsume was aiming this game toward little girls. There are tons of pastels and pinks, as expected, but it's definitely not a bad-looking game. I do find fault with the strange and wonky 3D models that appear when Sabrina changes into her tiara for her princess dress in a funky transformation sequence or when she is dancing. They look out of place in a game that is otherwise all 2D. As for the music and sound effects, there are rarely any sound effects save for an odd exclamation by Sabrina once you have completed a relatively high combo in the dance competitions or practice. Soothing melodies are present at all times, and the music you dance to is comprised of generic dancing instrumental music such as what would accompany a waltz, or genre-specific instrumentals. I suppose there was no need for licensed music since this game aims to cover that "princess aspect", but it would have made the game a lot more interesting. All in all, this game is a great attempt at getting children (primarily young girls) interested in gaming by catering to that age-old concept that every girl wants to be a princess. It's a pretty solid game, albeit extremely simple. What's admirable is the amount of work that went into the art and branching of different conversations to create a different experience depending on how you behave toward different princesses. It's not too fun for older, experienced gamers who already know their way around a game and would like more of a challenge, but for what it is it's actually pretty fun. I admit I enjoy it for playing favorites with the prince characters, because it amuses me. That certain little princess in your life would definitely appreciate this, if no one else!